Cocos Islands with its capital is located in Asia (Southeastern Asia, group of islands in the Indian Ocean). It covers some 15 square kilometers (about 24 times the size of The Mall in Washington, DC) with a population of 596. Malay and English are some of the languages spoken by the majority in Cocos Islands. There are no land based border this country shares with any other country. There are two inhabited islands in the group of Cocos Islands West Island and Home Island. The Cocos (Keeling) Islands are located in the middle of the Indian Ocean some 2750km north-west of Perth, and 900km west south-west of Christmas Island, its closest neighbour. During the year, as well as the traditional events such as Easter, New Year, Christmas etc, Cocos hosts a number of unique events. These include the annual Lagoon swim, where competitors swim from Home Island across the lagoon to West Island. Individuals or teams may enter and whether you are a serious contender or wish to join in with the Hash House Harriers (who always seem to get themselves disqualified for one thing or another), everyone has a load of fun. It finishes in the evening with dinner and presentations to the winners and boat drivers. Cyclone season is October to April. Fresh water resources are limited to rainwater accumulations in natural underground reservoirs. The terrain is flat, low-lying coral atolls. The average density of population is about 43 per km². The climate in Cocos Islands can be described as tropical with high humidity, moderated by the southeast trade winds for about nine months of the year. Possible natural disasters include cyclone season is October to April. To reach someone Cocos Islands dial +61 prior to a number. The local cellular networks are operated on 900. Websites typically end with the top level domain ".cc". If you want to bring electric appliances (e.g. battery chaarger), keep in min the local 230 V - 50 Hz (plugs: I). The sign for the locally used currency Dollar is AUD. There are 27 coral islands in the group. Captain William KEELING discovered the islands in 1609, but they remained uninhabited until the 19th century. From the 1820s to 1978, members of the CLUNIES-ROSS family controlled the islands and the copra produced from local coconuts. 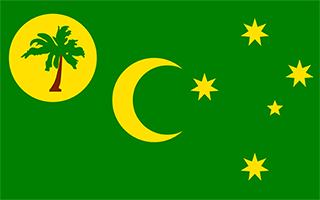 Annexed by the UK in 1857, the Cocos Islands were transferred to the Australian Government in 1955. Apart from North Keeling Island, which lies 30 kilometers north of the main group, the islands form a horseshoe-shaped atoll surrounding a lagoon. North Keeling Island was declared a national park in 1995 and is administered by Parks Australia. The population on the two inhabited islands generally is split between the ethnic Europeans on West Island and the ethnic Malays on Home Island.